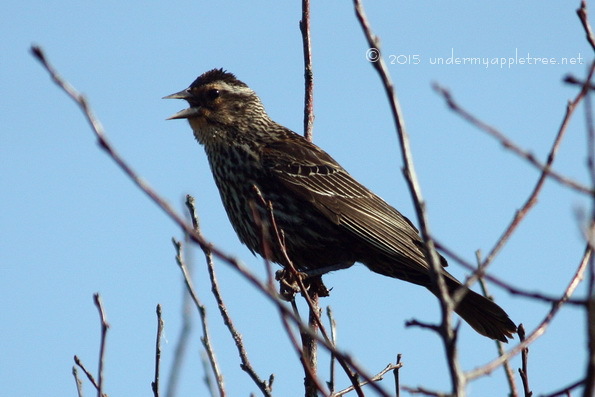 Almost wordless: Mrs. Red-winged Blackbird was not pleased that the path I walk to my monitor point in the prairie is close to her nest. Their parental instinct is awesome. The geese in our neighborhood don’t even like us to look at their goslings. Those geese can be mean – I’ve been bitten. Both the male and female blackbird, plus a few of their friends, kept diving at my head as I walked by – have to wear a hat! It’s the only path in or I would avoid them. Seems very watchful and protective. I love birds so much. Great shot! Just a momma being a momma. Great hot. When we had indoor/outdoor cats (now indoor only) blue jays use to attack one of our cats –eveidently he, at one point, came too close for comfort.